Twinkling stars Do you have any intriguing queries about twinkling stars? Come let's try to resolve them. A famous Austrian medical doctor, Alfred Adler, a psychotherapist, and founder of the school of individual psychology says about the twinkling stars, "God who is eternally complete, who directs the stars, who is the master of fates, who elevates man from his lowliness to Himself, who speaks from the cosmos to every single human soul, is the most brilliant manifestation of the goal of perfection". Most stars burn steadily and if we could see them from space they would not actually be twinkling at all. Have you ever noticed how the straight lines of bottom pool pad tiles of a swimming pool seem to wobble from side to side? This phenomenon occurs because the water in the pool bends the path of light from the straight lines. Similarly, stars twinkle because of turbulence in the Earth's atmosphere. The light from the stars has to pass through several miles of Earth's atmosphere before it reaches the eye of an observer. Here Earth's atmosphere acts as water in the pool. Stars as viewed from Earth The twinkling of stars is caused by the passing of light through different layers of the atmosphere. Stars as viewed by Hubble telescopeAlthough not the first space telescope, Hubble is one of the largest and most versatile, and is well-known as both a vital research tool and a public relations boon for astronomy. Air temperature varies a great deal. It typically decreases by 6.5°C for every kilometer as we go upward, away from the surface of the Earth. This is the reason for the chillness we feel on the top of mountains. The atmosphere is made up of several “layers”. Each and every layer has got a different temperature and density. Light ray bends more in cold air than in warm air as the cold air has got greater refractive index compared to warm air. Hence the air molecules of warm air are far apart from each other, to produce less scattering. Our atmosphere is very turbulent, with streams and eddies forming, churning around and dispersing all the time. These disturbances along with temperature variations in the atmosphere act like lenses and prisms that shift the incoming light from a star from side to side by minute amounts several times a second. This causes the star&apos;s image to change slightly in brightness and position, hence “twinkle”. Because of this effect observatories for studying the stars are situated on mountain tops. The reason for this is because the higher up you go, the air becomes thinner and it is less likely to cause the twinkling effect. Our scientists are experimenting on how to compensate for the twinkling effect by adapting the optics of our large telescopes as fast as it occurs. As a result, we should soon be able to produce much sharper images from here on the ground. You will notice that stars closer to the horizon twinkle more; this is because there is a lot more atmosphere between you and a star near the horizon than between you and a star, which is directly overhead. The Hubble Space Telescope(HST) is a NASA space telescope that was carried into orbit by a space shuttle in 1990 (Refer figure). It is so successful in outer space because there is no atmosphere to make the stars twinkle, allowing a much better image to be obtained. This is why the Hubble Space Telescope can produce the brilliant and crisp images of the universe that we have come to know. Planets as viewed from Earth The planets can be distinguished from the stars because their brightness varies in a regular cycle over a period of time. Why do planets don't twinkle like stars? Planets do not twinkle the way stars do. This is because the planets shine by reflecting light and are also larger in appearance than stars. This causes less refraction than with stars. 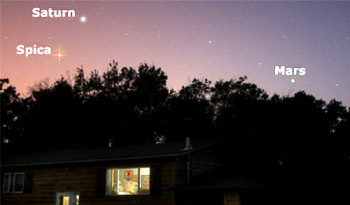 In fact, this is a good way of figuring out if a particular object you see in the sky is a planet or a star. Stars are so far away that they effectively act as point sources of light in the sky, and the light we see flickers in intensity as the incoming beams bend rapidly from side to side, while planets actually have finite size and are more closer to earth. The size of a planet on the sky in a sense “averages out” the turbulent effects of the atmosphere, presenting a relatively stable image to the eye. (Through a telescope with high magnification, however, we see shimmering images of planets). For a planet, light comes from a group of points in the sky forming the disk of the planet. The light from each of these points also flickers and changes colors. However, the flickering of one part of the planet is masked by the other part of the planet. The tiny instant that one part of the planet flickers out, another part might flicker into view. When one part of the planet flickers red for a tiny fraction of a second, another part might flicker green and another blue. The end result is that all of these effects tend to average out. So, to the unaided eye, the planet seems to shine steadily while the stars around it twinkle in the sky. Planets like Mars, Venus and Jupiter, which appear to us as bright stars, are much closer to Earth and look like measurable discs through a telescope. Again, the twinkling from adjacent areas of the disc averages out, and we see little variation in the total light emanating from the planet. Till when can a star twinkle? The stars illuminate till the fuel in it is available. The strength and luminosity of a star are dependent on its mass. Usually 90% of life of Stars is spent in burning hydrogen into helium on the main sequence. The lifetime of a star would be proportional to the mass of the fuel available divided by the luminosity if the luminosity were a constant. Hence the star illuminates till the fuel in it is available. 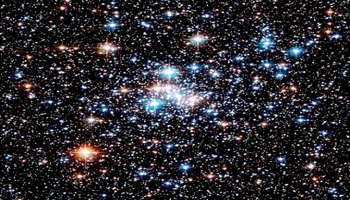 The first stars were composed almost entirely of hydrogen and helium. There was no oxygen, nitrogen, iron, or any of the other elements that are necessary for life. These were all produced in massive stars and were all spread throughout space by supernovae events. We are made up of material that has been processed at least once inside stars. Smaller stars have more lifetime Smaller stars live longer than larger stars because their rate of fuel consumption is not as rapid. Smaller stars outlive bigger stars! It has been observed that, larger stars have more fuel, but they have to burn (fuse) it faster in order to maintain equilibrium. Due to the thermonuclear fusion that occurs at a faster rate in massive stars, large stars use all of their fuel in a shorter length of time. 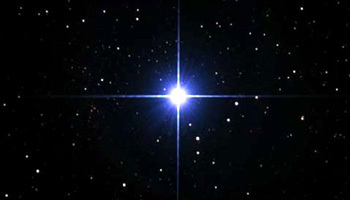 This means that bigger is not better with respect to how long a star will live. A smaller star has less fuel, but its rate of fusion is not as fast. 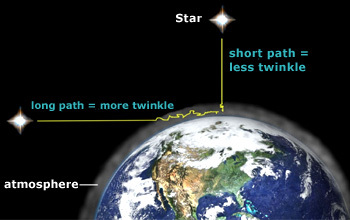 Therefore, smaller stars live longer than larger stars because their rate of fuel consumption is not as rapid. The real goal of life of a star is to achieve equilibrium. The term equilibrium means that there is no net change in the star. It was observed that in a stable star, the pressure exerted by the gas pushing out from the center is equal to the gravity force exerted by pulling the atoms inwards (towards the center). Hence the star is said to be in equilibrium if these forces are equal. Stars in Milky Way The Milky Way contains at least 100 billion stars and may have up to 400 billion stars approximately. 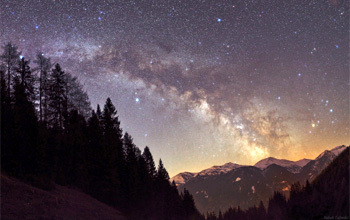 How many stars are present in the Milky Way galaxy? 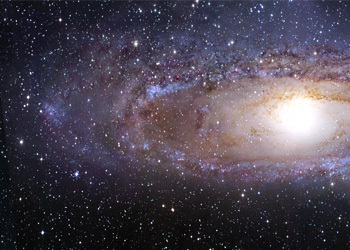 The Milky Way galaxy alone consists of 3 billion to 100 billion stars! It is impossible to know the exact value of the stars present. It can be more than the thought of a human being So while the stories and myths live on about the night sky, the exact number of stars is still not known, as space is truly the final frontier. 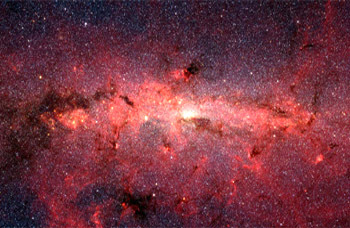 However the Modern estimate of the number of Stars in the Milky Way galaxy to be around 200 to 400 billion. We don&apos;t really count the number of stars which would take ages; instead we measure the orbit of stars that we could observe, to find the angular momentum and thereby the mass of the Milky Way. We observe the angular momentum and density of stars in other galaxies, and estimate the amount of dark matter (which is more than 90% mass of the star) and subtract it from the Milky Way mass to get the mass of the stars. The mass alone doesn&apos;t give us a count though. We have to know about how much each star weighs, and that varies a lot. So we have to class different types of stars, and figure out how many of each are around us. We can extrapolate that number and turn the mass into the number of stars. Obviously, there&apos;s a lot of error in this method. So next time you hear a kid singing "Twinkle Twinkle Little Star", you can think amusingly "Now I Wonder What You Are !"